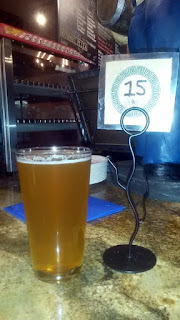 When my friend Randy Santel came through Oregon in January 2017, he stopped at Flying Pie Pizzeria and Opa Pizzaria to dominate their respective pizza and calzone challenges. While I've already reviewed both places in the past, I spontaneously decided to do a comparison and contrast of the calzones at these two great spots. 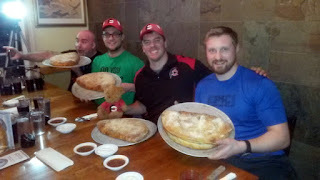 Max, Ethan, Randy, and Patrick attempting Opa's calzone challenge! Randy wasn't alone on his food challenge tour; he brought Magic Mitch Dombrowski and Eager Ethan Teske with him. Max Carnage and Patrick (Pac-Man) Thomas from the Big Eaters Club also stopped by to do food challenges. 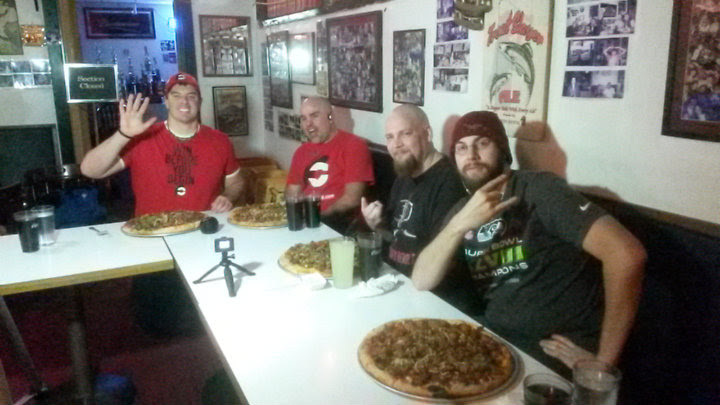 Randy and Max with two fans attempting Flying Pie's pizza challenge! Flying Pie Pizzeria has two challenges. The first is a 16" large combo supreme pizza that costs about $30. It probably weighs about 6-7 pounds because they put A LOT of toppings on. 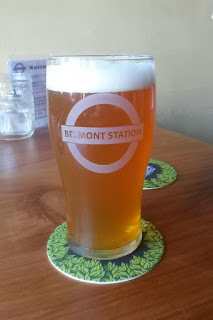 If you finish it in one hour, you get it free, plus a T-shirt. The second challenge is their XL combo supreme pizza that costs over $37 and is probably about 9.5 pounds. To my knowledge, no one has completed the XL pizza challenge. 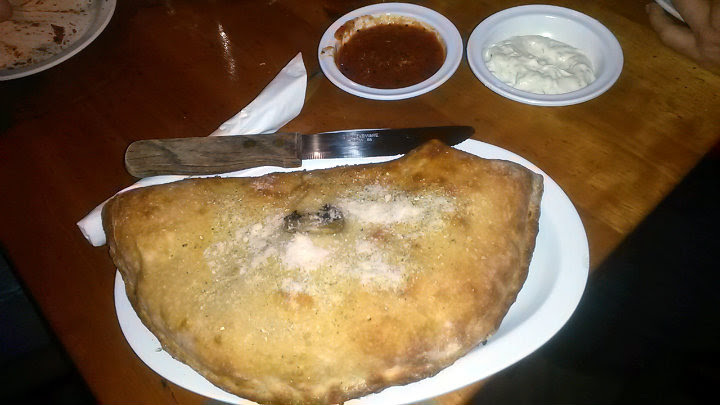 At Opa Pizzaria, you'll take on a 5-6 pound calzone that costs $21.95. If you finish in 30 minutes, you get the meal free, your picture on their wall of fame, and a T-shirt. You'll actually be eating the equivalent of a large pizza and another small pizza. Insane. Of course, I already knew that I wasn't adequately trained and in no shape to do any type of quantity challenge. I benched myself in favor of beer thirty. 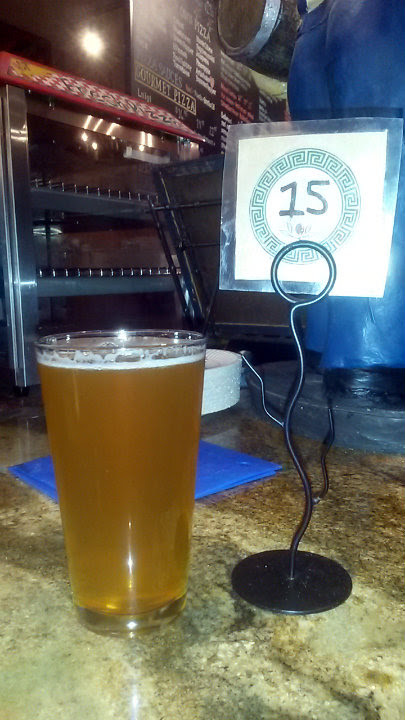 Barley Brown's Pallet Jack and Hop Valley's IPA are awesome choices if you can get them. I had never tried Flying Pie's calzone, and decided on a regular De-Lite-Ful ($7.50) with ricotta, spinach, zucchini, and black olives. Lots of marinara on the side. Wonderful crunchy (yet fluffy) crust and lots of filler inside. I didn't recall getting too much spinach; it was mostly olives, ricotta, and zucchini. 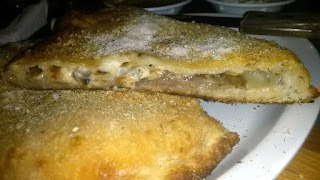 At Opa Pizzara, I went with something more unique, the Gyro Calzone ($10.95): Garlic oil, gyro meat (lamb-beef blend), garlic, mushrooms, onion, and feta. It's even served with sides of marinara and tzatziki. I don't know of any other place (yet) that offers such a calzone, and I highly recommend this. Very delicious. Decent amount of gyro meat and feta, and the garlic oil helps in eating this even faster. My friends wanted this as their food challenge calzone, and all of them enjoyed it. Both calzones were about the same size in length and width, maybe the edge goes to Flying Pie on size if I had to pick one. Flying Pie's was filled with more ingredients. For the price, you clearly have to go with Flying Pie. All calzones on the menu are $7.50 for the regular, and their regular can feed one hungry regular person (two people for a light snack). 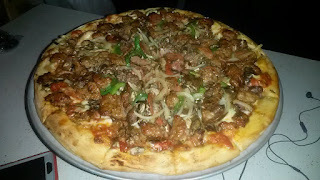 People with food challenge-sized appetites should just try the food challenges here. 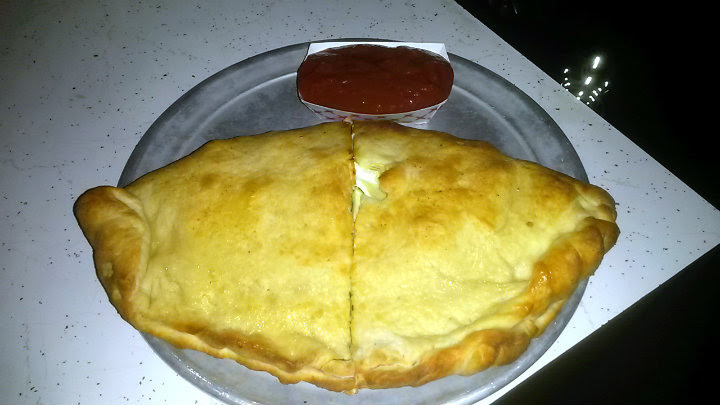 You can make your own calzone at Flying Pie, which starts at $6.25 (regular) or $9.75 (huge). The price goes up depending on what ingredients you add to the calzone. It's not initially clear if Opa Pizzaria allows you to create your own calzone, but I'm sure they will give you that option. As a final test, I intentionally ate half at the restaurant and saved the other half for leftovers the next day. I microwaved each for just 45 seconds; the end result both times was a calzone that had lukewarm spots and cool spots. Both calzones again were delicious. I was able to really see the abundance of filling that the Flying Pie calzone contained. Opa's calzone, while not as filled with ingredients, still brought the awesome flavor from the garlic oil and feta. 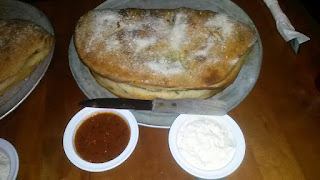 I also think Flying Pie's calzone retained the advantage on fluffy dough this time around. For next time, I'd be interested in Flying Pie's Supreme calzone (one meat, onions, olives, mushrooms, and green peppers) and Opa's Chicken calzone (red sauce, chicken, onions, mushrooms, onions, feta). Or, if Opa does allow a create-your-own calzone option, I'd really get adventurous. Whether you go with Flying Pie or Opa as your calzone choice, you can't go wrong. I'd recommend going to both places to see which one you prefer!